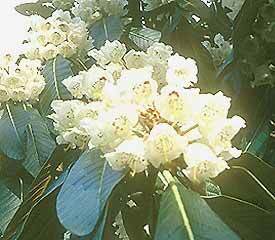 Flower/Truss Description: Oblique-campanulate, creamy white to pale yellow, with crimson basal blotch. Truss holds 12-30 flowers. Foliage Description: Leaves oblanceolate to broadly elliptic, up to 35" long, shiny, plastered silvery to fawn indumentum.